power in 2007, broken down by country. few decades’ worth of uranium, or do we have enough for millennia? only mined uranium, and second using ocean uranium too. Table 24.2. Known recoverable resources of uranium. The top part of the table shows the “reasonable assured resources” and “inferred resources,” at cost less than $130 per kg of uranium, as of 1 Jan 2005. These are the estimated resources in areas where exploration has taken place. There’s also 1.3 million tons of depleted uranium sitting around in stockpiles, a by-product of previous uranium activities. Figure 24.3. 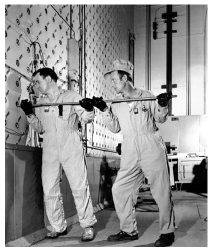 Workers push uranium slugs into the X-10 Graphite Reactor.